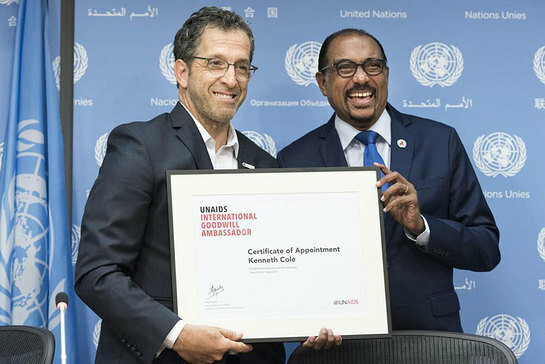 Michel Sidibé (right), the Executive Director of UNAIDS, introduces fashion designer Kenneth Cole as an International Goodwill Ambassador. “We are entering a crucial phase of the response to HIV and I know that Kenneth can make a significant and powerful contribution towards our shared vision of ending the AIDS epidemic by 2030,” said Michel Sidibé, the Executive Director of UNAIDS, speaking at a press briefing in New York. “His commitment, compassion and resolve will magnify our efforts to include everyone and to ensure that no one is left behind,” he added. The announcement was made at a special event held on the eve of the three-day United Nations General Assembly High-Level Meeting on Ending AIDS, which starts tomorrow at UN Headquarters. In his new role as an International Goodwill Ambassador for UNAIDS, Mr. Cole will work to rally the global community by continuing his longstanding role as an advocate for an inclusive response to the AIDS epidemic. He will help with the communication of clear benchmarks and goals in the AIDS response, including amfAR’s mission of finding a cure for HIV by 2020, in order to realize UNAIDS’ vision of ending AIDS as a public health threat by 2030. “I am confident that if people are put at the centre of the AIDS response we can realize one of this century’s greatest humanitarian achievements – the end of the AIDS epidemic,” said Mr Cole. “I am honoured by this appointment as a UNAIDS International Goodwill Ambassador. It is my hope to help intensify efforts to end the epidemic for everyone, everywhere,” he stressed. Mr. Cole has been a leading voice in the global response to AIDS for more than 30 years and continues to be a passionate champion for people living with HIV. In addition to managing his business interests, Mr. Cole has been chairman of amfAR, the Foundation for AIDS Research, since 2005. According to UNAIDS, he was instrumental in the launch of amfAR’s Countdown to a Cure campaign, which supports amfAR’s recently opened Institute for HIV Research, based at the University of California, San Francisco. The mission of the institute is to accelerate progress towards developing a cure for HIV. Meanwhile, the UN reported today that Thailand is the first Asian country to cross the threshold towards zero mother-to-child transmission of HIV and syphilis, as well as being the first country with a large HIV epidemic to ensure an AIDS-free generation. The Minister of Health of Thailand was presented with the certificate of validation during a ceremony which took place in New York on the eve of the UN General-Assembly High-Level Meeting on Ending AIDS. The UN World Health Organization (WHO) also applauded Armenia, Belarus, and the Republic of Moldova for their remarkable accomplishments in eliminating mother-to-child transmission of HIV and syphilis.